Its ten years since I first set foot on a snowboard! It was on a ski holiday with some pals to Bormio in Italy. Most of the others had been skiing a few times and persuaded me that I should ski with them rather than spend my time falling over on the bunny slopes. As the end of the holiday approached I was desperate to try a snowboard and cajoled the most adventurous member of the group into joining me for the last day. We strapped in and headed up the nearest short drag lift (getting the hang of that was half the battle) then we just went for it. We had no instruction but tried to copy the riders we had seen. I was hooked from the first turn. I spent the rest of the afternoon falling on my head and laughing with delight, meanwhile my friend was struggling with the drag lift and gave up out of caution when he saw me perform a particularly acrobatic head plant (happily he tried again a few years later and has long since given up skiing). Amazingly, a photo from that very first day survives. 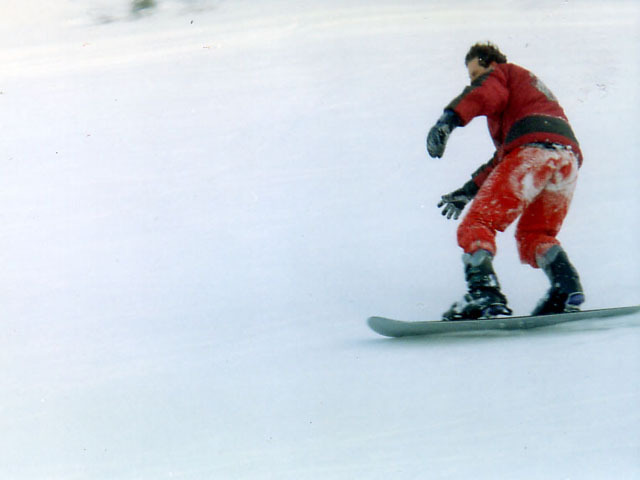 Note the ski boots and plate bindings and the 1980s hand-me-down C&A "ski wear"!